Mid bloomer. Small yellow-green pineapple-shaped flower heads, distinctive odor, low plant. Notes: Aster (Sunflower) family, Mayweed Tribe. Can have people gently squeeze flower to see what it smells like. Also called Wild Chamomile. It is related to feverfew, used for migraines. Chamomile is used for arthritis, some species used to make chamomile tea for relaxation. 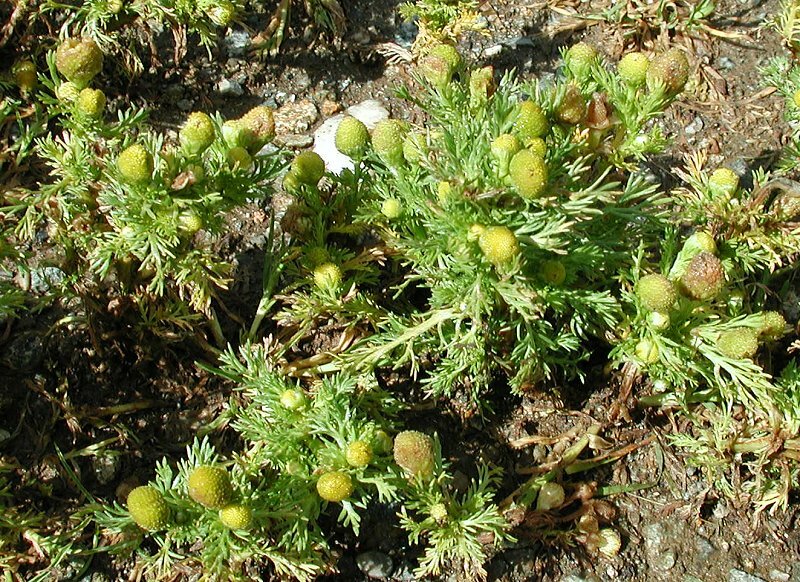 Some sources give the Pineapple Weed as Matricaria mactricarioides, e.g., Peterson & Niehuas. The USDA lists nothing for Chamomilla and 4 species for Matricaria, but nothing for Matricaria mactricarioides. The classification below is for genus Matricaria.